Removal companies Spain to UK can ensure that your belongings are packed safely and securely, from the largest item of furniture to the smallest ornament. However, if you plan on packing smaller items yourself, it needs to be done correctly to prevent damage. These box packing tips should help your belongings reach Spain in one piece. Removals from Spain to UK, or vice versa, need to be done with care and patience, which is why using a professional removals company with plenty of experience is always the better idea. It�s well worth asking your chosen company to quote to pack for you, but if you choose not to take advantage of this service, then there are some tips to follow to get it right. You should never, for example, pack a box so that it weighs more than 25kg. This is the maximum weight one person should lift, as a box weighing more than that can cause injury. Boxes stack better when they are completely full, but filling a large box can make it too heavy. Therefore, half-fill the box with heavy items, and fill the remainder with lighter ones such as pillows or cuddly toys. If the box is already heavy at just half full (books often do this), then cut the box down so that it is smaller and has no empty space in it. A company that specialises in removals to Spain or the UK will be able to provide you with packing materials including bubble wrap and tissue paper, and it is important that you use this to wrap fragile, breakable items well. For really precious items, use pillows or other bedding as extra protection. 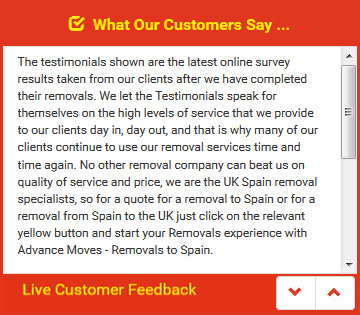 For the most experienced of removal companies Spain to UK, visit Advance Moves at http://www.advancemoves.com/. Our quick quote system will give you a good idea of exactly what you will be paying. If you need any further advice, our team can be contacted on 0871 218 0612 or info@advancemoves.com.